Attached is the May 2016 Newsletter. It includes the advisory board ballot. This year we are electing four new members to the advisory board. Four members will serve a two year term replacing the board members that have completed their term. We thank all outgoing board members for their time and input on AHCA matters. Below are AHCA members who have accepted the nomination to serve on the advisory board. Please vote for four. A ballot is attached at the end and can also be found on the website. Your ballot can be mailed to AHCA, PO Box 350, Swartz Creek, MI 48473 or emailed to info@ahcamail.com or private message Rhonda Miller-Lebbin on FB. Only members with current regular memberships are eligible to vote. Please include your AHCA number (if you know it) on your ballot. It would be appreciated if you would return your ballot by June 1, 2016. Born and raised in Oklahoma, my mom was a police officer, and my grandfather (my mom’s dad) was a cattle rancher. I spent most of my weeks in school and working in rual Oklahoma City, and my weekends and summers on my grandfather’s cattle ranch. Grnadpa didnt have much use for a horse due to he could call to the cattle and theyd come up and into the pens. So my horse expierence started at the age of 12, when my mom won a 2yr-old colt at a hunter jumper show in Oklahoma City. i was charged with breaking this what I now call “a total idiot”. as time moved on I started riding other peoples horses, just loping and riding the rough off, not training by no means. My mom had sent me to some John Lyons symposiums to try to learn more about horsemanship. She knew I had the bug and was well on my way to becoming a hand at handling horses. i was also fascinated with the blacksmith that came out and took care of the horses feet. I wanted to learn more about this “very cool” job that was called “Blacksmith”. I was able to talk the Blacksmith into letting me ride wiht him after school and on the weekends. by the time I was 16 I was trimming my own horses and a few of the neighbors at the bording stables were at(grandpa wouldnt let us keep the horse on the ranch, like i said, he had no use for horses). After moving to Texas in January 2000(after i figured out the lights were gonna stay on), I started training cutting horses, and showing. my shoeing business was also taking off like a scalded dog as well, i had horses coming in for training, shoeing horses in the evening and showing cutters on the weekends. In 2003 i had gotten severly injured in a shoeing accident, I had gotten kicked in the knee, cracked my pelvic, and cought one in the head knocking me out. that was the turning point of my training career. After recovering from the incident, i was on to shoeing horses full time, and riding my own horses. I stepped off into the podiatry end of my shoeing career, working with veternarians and studying under world known vets such as Dr Rick Redden, Dr Sammy Pittman, and Dr Amy Rutker. My shoeing business exploded, being called form one vets office to another to help work on lame horses and getting them back on track to sound. In 2012 I was introduced to the American Horsemenship Challenge Association by my now fiance’ Shelly Sylvester. I was amazed at the comrodery, sportsmanship and horsemandhsip that this organization promoted. I immidiately joined and was hooked. being a farrier i had been shoring for all disiplines of equine events from back yard pets, to cutting, jumping, rodeo horses, to obstacle event horses, to carriage horses(Drafts). The A.H.C.A. was the only organization I had seen with the comrodery, horsemanship, and the sportsmanship was impressive. I did not ask to be on the board avisory of the A.C.H.A, I was nominated, and not by “family”. I dont play politics very well, I tell it like it is, call a spade a spade. I’m the first to admit when I am wrong and will do what I can to right the wrong. I want to help this organization grow, and help the new horse owners learn how fun riding horses can be. Its great when you as a rider and your horse become a team to work thru “obstacles” of every day life. thanks for the nomination, hope to see yall soon..
1953 : My experience with horses started by driving a team of horses for a neighbor, the team was hauling hay. My first ride was on a Percheron with a harness on, I was standing on the traces and hanging onto the hames. 1962 – 1984: Career in US Coast Guard, retired as Chief Warrant Officer W4. 1975: Acquired two Welsh ponies for my kids. Have owned horses continually from that time on. 1962 – 2016: Many Leadership roles in USCG and church campgrounds. I have served on various Boards for 30+ years and I am familiar with board administration, budgeting procedures, meeting protocol, etc. I have been a self-sustained Pastor for Community of Christ church since 1978. Currently I am co-owner of Eagles Flight Arena with my daughter and granddaughter. We own 120 acres with an indoor and outdoor arena, 5 miles of working trails, board horses, hay production, etc. 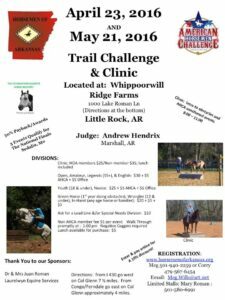 I have also assisted with the trail competitions we have held at the facility, as well as helping to Judge the AQHA sponsored trail challenges we have held in the past. I am open to answering any questions you might have and I look forward to doing what needs to be done to help this Association grow and prosper. I work in Environmental, Health and Safety for the Natural Gas Pipeline Division of Kinder Morgan. I am the recipient of the President’s Award for Volunteerism and currently serve as treasurer of the Board for the Galveston Chapter of the Coastal Conservation Association (CCA). I am skilled in event planning and administration and fundraising, and have helped to organize and grow a yearly benefit for the Galveston CCA; the event grew from raising $80,000 in 2012, to $100,000 in 2013, and in 2014 earned more than $175,000. I rode horses back in my teens and twenties in Central New York where I grew up. Then came life… marriage, kids, work, etc. After my son graduated from high school, I began to volunteer at a Rescue Operation for Horses. It was there that I realized that my love for horses had never waned. I adopted a skinny sorrel gelding named Mowgli. Lucky for me, I met Shelly Sylvester and began to take riding lessons. When Shelly decided to start a Gulf Coast Affiliate of the AHCA in Texas, I was there to handle the administrative side. I fell in love with the Organization, the founders, and especially the riders and their horses. Everyone in this organization seems to share the same family values, ideals and are like-minded in their love of the horse. I would like to be on the Board as I believe that with my skill-set and growing knowledge of the horsemanship world that I can be an asset to the organization. I also enjoy fishing, and spending quality time with my husband of 27 years, James; my son Jake; and my other four legged friends, my African Sulcata Tortoise – Miss Kitty and our three dogs Rocky, Zoe, and Sushi. Ho my name is Cricket Nelson, I started with AHCA in 2012 and have been enjoying it ever since. I have attended nationals the past 3 years and am a founding member of Middle of the Mitten AHCA. I would love to be able to help this organization move forward and get many more people involved. I’ve had a fulfilling life with horses. Starting with a ranch horse from Texas, as a youngster was fortunate to find work at a local camp/academy who brought in various trainers from all over the country and from several disciplines. My background includes team penning, a little team roping, hunter/jumper, dressage and trail riding. I have had the opportunity to train in Canada for 2 weeks with the Royal Canadian Mounted Police. I am a certified Mounted Police instructor. I own and operate Kitty Hawk Ranch in Kansas City, MO. I enjoy traveling with my horses and friends. Judging has become my career focus at this time and I am striving to be certified in several associations and venue. Learning is living. Helping people and horses is my passion. Brandy was originally from Texas but spent half of her childhood in Arkansas. She graduated high school, obtained her BS in Biology, and her BA in Criminal Justice in Arkansas. She moved to Missouri in 2003, where she completed her Masters in Teaching. She was a science teacher from 2004-2015, with teaching assignments that spanned from 4th grade to college. Equine competition consisted of barrel racing, poles, and sorting before her first obstacle competition in 2013. It was at a double sanctioned UHCA/EXCA event that she realized that there were huge gaps in her equine training. At that competition she placed last in the Novice division and was disqualified in the Intermediate division for going over the 10 minute time limit. This was not the results Brandy was use to achieving in her competitive sports. In fact, Brandy competed in full contact martial arts for 22 years, and is a decorated heavy weight fighter that has represented the USA in international competitions in 5 countries. The weekend before her first obstacle competition, she had fought in Oklahoma City and qualified for nationals as a World Class Athlete in two divisions. Needless to say, a new fire had sparked that day. Brandy never returned to the ring and dove head first into obstacle competition. By the end of 2013, Brandy finished 3rd overall in the Novice division and 6th overall in the Intermediate division in the UHCA. In 2014, she won the Championship Buckle and Championship Saddle in the Novice division, and placed 5th overall in the Intermediate division. She also qualified for EXCA Worlds in the Novice division. She went to Worlds and placed 6th overall out of 28 competitors. In 2015, Brandy won the Reserve Champion Buckle in the Intermediate division and qualified for EXCA Worlds in the Intermediate division. However, in 2014, Brandy and her husband purchased his family’s century farm and turned it into an equine trail riding facility called Von Holten Ranch. In order to prepare for a large event at their facility, she was not able to attend EXCA Worlds. This is where AHCA introduced itself to Brandy. She competed in her first ever event as an Open rider at AHCA Nationals and placed 3rd overall. She is currently a certified judge for ACTHA, ETS, AHCA, and UHCA. Hello my name is Stacy Westbrook. I have owned horses since I was 3yrs old. my daughter and I have been involved with AHCA since 2012. We have been blessed to attend national events since 2013 and I became a judge in 2015 with AHCA. This organization means a lot to my daughter and I as it is based on principles that we live our lives by. I love the fact that this organization focuses on horsemanship so that we may mold our children to ride correctly. I would enjoy working with the board members to continue to grow our AHCA family and support our future riders so that they will have the knowledge and horsemanship to exceed in any event they would like. Thank you for your consideration. Return by June 1, 2016.